Tour operators have stopped selling trips to Egypt and promised to bring home within days most of the 30,000 Russian tourists who still have not left the riot-gripped country. Egypt attempted to return to normal life Sunday after almost two weeks of political protests and street clashes, with banks briefly resuming operations and political opposition entering into talks with the government, but it remained unclear whether peace could be sustained. More than 300 people have been killed and dozens injured since Jan. 25, when protesters took to the streets to demand the ouster of authoritarian leader Hosni Mubarak, 82, who has ruled the country since 1981. Five leading tourist operators said they will finish bringing back their clients by Wednesday, the Russian Tourism Union reported on its web site Sunday. The five serve a combined 90 percent of Russian tourist traffic to Egypt, Er-Portal.ru said. Smaller players have chimed in as well. “We have stopped sales [of tours to Egypt] until the situation gets back to normal,” a representative of the Moscow-based operator Elite Tours told The Moscow Times on Friday. Only 30 percent of the tourists have agreed to cut their stay short as of Sunday, but the figure is expected to grow as operators continue their efforts to convince tourists to return, said Maya Lomidze, head of the Russian Tourism Union, Itar-Tass reported. No state-sponsored evacuation was ordered, and the tourists are simply given the opportunity to change their return plane tickets to earlier dates. 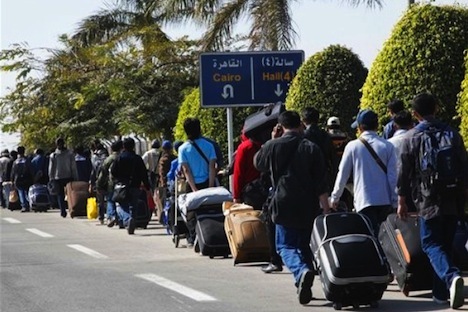 Russian tourists unwilling to leave are influenced by the English, who keep on arriving to Red Sea resorts of Hurghada and Sharm el-Sheikh, Lomidze said. There is no violence in resort cities, but the quality of services offered to tourists is dropping, she said, adding that some hotels have canceled all-inclusive food deals for clients. Some Russians were still departing to Egypt over the past week, arranging their trips independently, not through tourist operators, tourism association spokeswoman Yelena Tyurina said Friday. No estimate for the number of outbound tourists was available over the weekend. Tour operators were offering alternative destinations, including Turkey and Thailand, to those who have booked tours to Egypt, Marina Makarkova, a representative for one of the five industry leaders, Tez Tours, said Friday. Tyurina said the situation was “unprecedented” for the Russian tourist industry. It remained unclear how much tourist operators will lose over the “Nile Revolution,” as the protests have been dubbed. February is a low season for tourism, and most tours sold at that time are budget deals. Still, Egypt is the second most popular foreign destination for Russians, losing out only to Turkey. Some 2 million tourists traveled to the country in 2009, according to industry statistics. Originally published at Moscow Times.